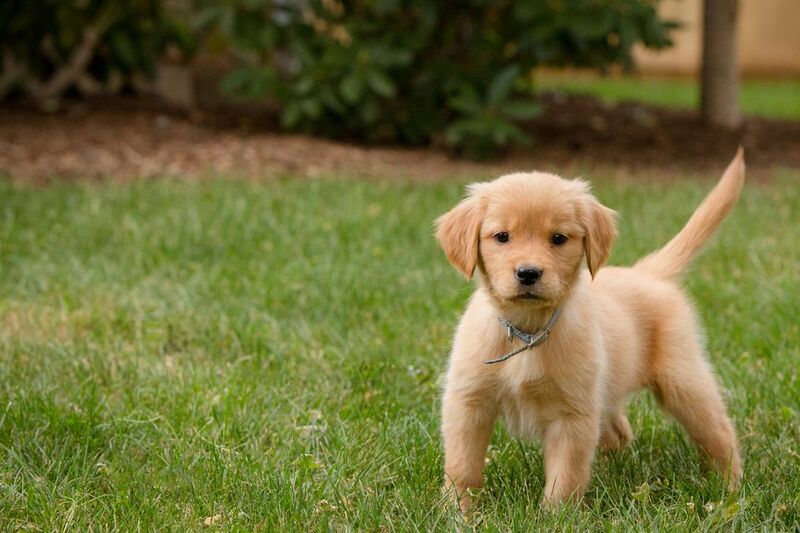 Puppies typically exhibit fear when confronted with unfamiliar people, animals, or situations. This normal emotion is a protective mechanism that prompts the dog to either fight or flee the danger. It is common to all animals (including humans). There are steps you can take to alleviate some of your puppy's fears and to prevent it from overreacting when it does become frightened. Puppies may react fearfully to unfamiliar animals, meeting children, or introduction to babies. Puppies can freak out at the sight of a people either in uniform, with long hair, or wearing a hat. Some northern breeds like Siberian Huskies, as well as larger breed dogs like German shepherds and Labrador retrievers seem more prone to noise phobias like fearfulness during thunderstorms or fireworks. And a dog that is frightened by something specific during the socialization period may always react to that stimulus in a fearful manner. The pup's response to fear depends on the circumstances and how confident (or not) the pup may be. When the opportunity is available, most pups run away or try to hide from the threat. Puppies anxious or fearful of being left alone may try to escape by clawing windows or doors, and crying or howling for company, or even chewing or eliminating inappropriately. A submissive dog crouches in a low position then rolls on his back and performs submissive urination to appease the perceived threat. When escape isn't possible, and pup feels cornered or is defending its property (the yard for example), the result may be fear-induced aggression. You may notice this reaction in your puppy when you reach into its crate and it snarls and snaps at you, but then becomes friendly and happy once out of the confinement. The dog can’t escape the crate, so your hands coming at it may provoke a cage-fear reaction. Your puppy communicates its fear and tries to drive the threat away by growling, barking, raising its hackles and flattening its ears. When these signals, meant to make an aggressor back off, don't work, the dog may attack. The best way to prevent fear is to build confidence at an early age by exposing puppies to a variety of positive new experiences. Dogs that are particularly shy may benefit from obedience training and interactive play sessions. Nothing builds canine confidence like being praised for doing something well. Tug-of-war with a towel is a great confidence boost for dogs. If you notice that a particular trigger is the only cause of fear, try eliminating that trigger. If that's not possible, slowly help your dog become comfortable with the trigger and with small steps, their fear may be gone. Many young dogs tend toward shyness during adolescence, at about four to five months of age. Careful socialization to potential triggers during this time can be helpful. Most of these fear-related behaviors fade as the dog matures, gains confidence, and becomes used to the triggering situation. Exceptions can develop into problem behaviors. Punishing the dog for fearful behavior does not work, and in some instances will escalate the behavior and make it worse. An extremely fearful dog, especially one who reacts with aggressiveness, need more help that most pet owners can offer. Consult a professional animal behaviorist for advice; some dogs may benefit from anti-anxiety medications.